Actualizado el 8 de noviembre, 2018 - 22.51hs. NASHVILLE, Tenn., Nov. 8, 2018 /PRNewswire/ -- Aflac, the leader in voluntary insurance sales at U.S. worksites, today delivered My Special Aflac Duck™ to Monroe Carell Jr. Children's Hospital at Vanderbilt in Nashville, Tennessee. My Special Aflac Duck, designed by Sproutel, is a social robot that uses medical play, lifelike movement, and emotions to engage and help comfort kids during their cancer care. Today's first-ever delivery to the Children's Hospital at Vanderbilt follows more than 18 months of child-centered research conducted with children, parents and medical providers at the Aflac Cancer and Blood Disorders Center of Children's Healthcare of Atlanta. "Today's special delivery in Nashville marks yet another important milestone in our mission to put a My Special Aflac Duck into the arms of every child newly diagnosed with cancer in America to help them cope during their often-challenging cancer journey," Aflac Chairman and CEO Dan Amos said. "It has been a wonderful investment at Aflac to see the joy and witness the smiles on kids' faces when they receive their own comforting companion. Our employees and independent agents are honored to be a part of creating these memorable moments for the brave children being treated at the Monroe Carell Jr. Children's Hospital at Vanderbilt." To date, Aflac has invested more than $3 million for the research, design and delivery of My Special Aflac Duck across the nation. At today's delivery event, attendees were treated to a demonstration of the robotic duck showcasing how it will help comfort children and serve as a tool for health care professionals to use with their patients. After the demonstration, children and their parents were sent on a fun scavenger hunt, finding clues and visiting various locations at the hospital, eventually leading them to the discovery of their very own My Special Aflac Duck. 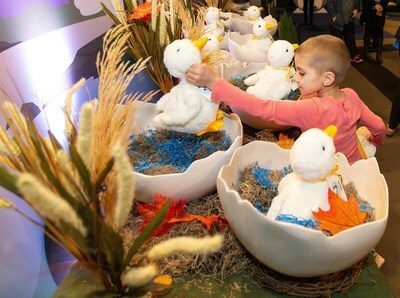 "To see courageous children that are facing all types of cancer react to the My Special Aflac Duck with excitement and wonder has brought upon a sense of fulfillment beyond measure," The Aflac Foundation, Inc. President Kathelen Amos said. "The entire Aflac family is proud to introduce this special social robot to the young patients and families in and around Nashville and to be able to lend our beloved Aflac Duck to a cause that is so close to our hearts, with the potential to make a lasting impact on these extraordinary families." As part of its ongoing Aflac Childhood Cancer CampaignSM, Aflac will expand distribution of My Special Aflac Duck to hospitals across the country, providing a duck to any newly diagnosed child, ages 3 and above, free of charge. The cost per unit to Aflac is approximately $200. Medical and nurturing play: A chemotherapy port allows children to mirror their care experiences via play, giving them a sense of control during the process. The duck's no-cost companion app allows users to "bathe" it, "feed" it and give it "medicine" via augmented reality. "When we care for children with cancer, we focus on the whole child and family and not just the disease," said Debra Friedman, M.D., director of the Division of Pediatric Hematology/Oncology and associate professor of Pediatrics at Monroe Carell Jr. Children's Hospital at Vanderbilt. Friedman, who holds the E. Bronson Ingram Chair of Pediatric Oncology, added, "My Special Aflac Duck will be an important part of the comprehensive care benefiting children with cancer and their families. Our pediatric cancer program is extremely grateful to Aflac for their generosity in partnering with us in the care of our patients." "For more than two decades, Aflac's commitment to childhood cancer treatment and research has remained at the forefront of our corporate responsibility program," Aflac Market Director in Tennessee Brent Goode said. "We are proud to build on our efforts and thankful to our partners at Children's Hospital at Vanderbilt for the opportunity to introduce My Special Aflac Duck to the young patients being treated for cancer here in Nashville. Their support will propel us toward our goal to help make a difference in the lives of children and families across the nation." Since 1995, Aflac has contributed more than $128 million to the pediatric cancer cause, including more than $500,000 donated each month by 17,000 independent agents licensed to sell Aflac products. The funds are committed directly from their monthly commission checks. To see My Special Aflac Duck in action and to learn more about this important cause, please visit AflacChildhoodCancer.org.